Fall is just around the corner and transitional pieces, like this black lace dress, are key for a budget-friendly fashionista like me. I previously showed you how I styled this dress for Summer with a bold statement necklace and white accessories and today I bring you my fall version. It's easy to transition pieces with layering, but it's especially easy when those layering pieces are in earth tones or leather textures. I also added booties which gives a dress an instant fall touch. I kept my lipstick neutral for a more casual look. About the Outfit: Wallis Dress (sold out, but similar here), Target Jacket, MyMonogramNecklace.com, F21 booties (similar) & sunglasses (similar), H&M ring. I just love how you took this dress all the way to Fall. This is a great Pre-Fall look. I am feeling inspired. Lovely! The LBD is gorgeous. I love this fall look! The jacket is perfect with the dress! So chic and edgy! 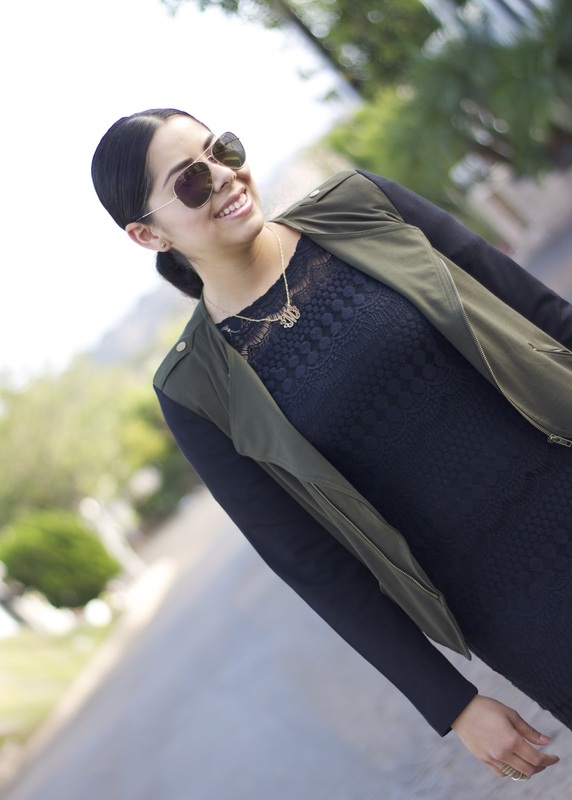 I love cargo jackets, they are a perfect transitional outwear! Siempre bella! I LOVE, LOVE this outfit! That dress looks amazing on you! The dress is great, gorgeous & both pieces are so versatile. I can't wait to see the different ways you wear them. You're so ready for fall, love the dress. love the vest! 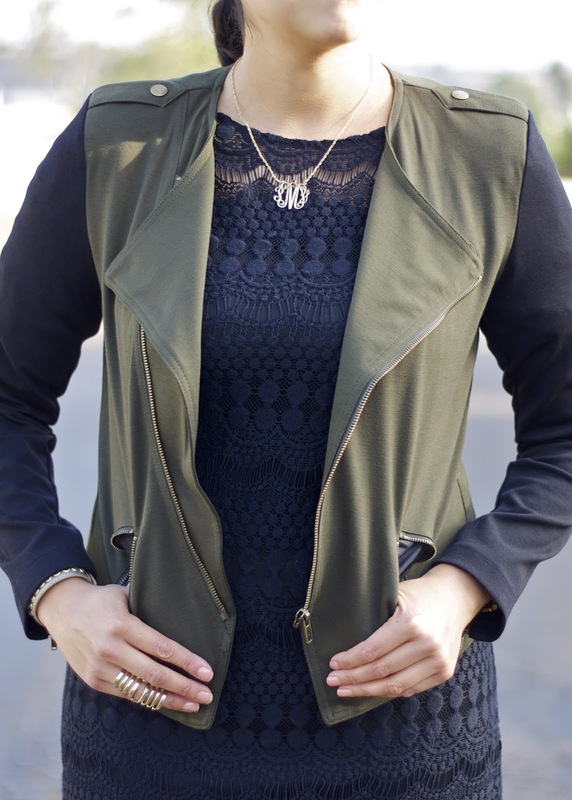 definitely a great piece for transitioning into the fall. good luck on the contest girl! I love this look! Beautiful LBD and perfect layering! Oh I like your fall outfit, I just saw that jacket at target and really wanted it but they didn't have my size. But yeah i think that the jacket looks great with the dress. El vestido es divino y me gusta mucho la chaqueta Pau!